Many teenage girls diet to the point where they develop chronic eating disorders like anorexia. Experts say the best way to prevent this is to help adolescent girls develop a positive self-image. "Adolescence is when youngsters start to care about their looks and become very sensitive to what others think about them," said Kim Yul-ri, a psychiatrist at Inje University Seoul Paik Hospital. "They tend to want to be skinny, as they are influenced by TV celebrities." 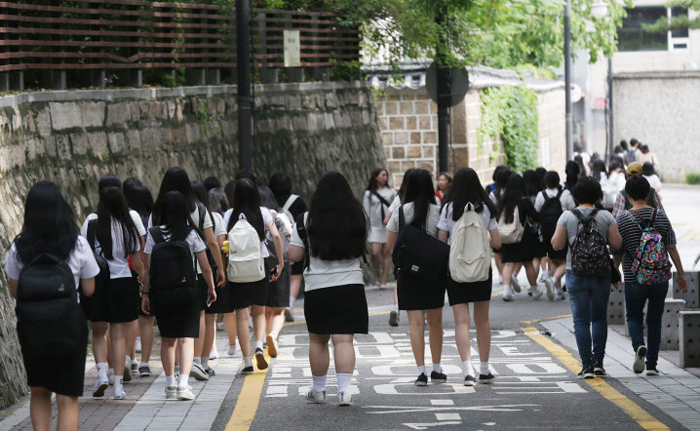 Students leave a high school in Seoul on Aug. 17. "Eating disorders during puberty can stunt growth and leave teens physically weak," said Song Yun-joo, a psychiatrist who runs a clinic in Seoul. Two out of 10 Korean teenagers of normal body weight believe they are obese. Analysis of national health surveys from 2013 to 2015 shows that 17 percent of 1,098 teenagers of normal weight considered themselves obese. Some 65.7 percent of this group were on a diet, as were 36.9 percent of those who thought their weight was normal. Excessive weight loss in adolescents leads to stunted growth. "People reach their peak muscle and bone mass during the period from adolescence to early adulthood," said Park Min-sun at Seoul National University Hospital. "If they don't build enough muscle mass during this period, they will start to lose muscle and bone mass at an earlier stage when they are aging."